General Hospital RUMORS: Laura and Carly Team Up To Help ‘Mystery Patient’ And Crack The Case! General Hospital rumors tease that Laura Collins (Genie Francis) will soon get around to a visit with the Corinthos family, and that will include catching up with Carly Corinthos (Laura Wright). After all, the Spencers and the Corinthoses go quite a way back. Spencer (Anthony Geary) and Sonny Corinthos (Maurice Benard) were good friends, and Sonny’s sister Courtney Matthews (Alicia Leigh Willis) was the mother of Laura’s grandson Spencer Cassadine (Nicholas Bechtel), and Laura’s son Nikolas Cassadine was his father. When Laura hears about the difficulties in Carly’s life, more than likely the subject of Carly’s time in Ferncliff will come up. Laura will be disturbed when Carly tells her about the Kevin lookalike she saw in the halls at Ferncliff, even though Carly has decided he was a mere hallucination and will laugh it off. When Carly talks about the mystery patient who communicated with her through the wall with Morse Code, Laura may start putting two and two together and realize her new husband Dr. Kevin Collins (Jon Lindstrom) is truly not himself-literally! The Spencers came back to Port Charles after nine years on the run from mob boss Frank Smith (Joe Cortese) in 1994, and were settled down as a happy family when Lulu was born in August 1994. This would have been during the same time period that Ryan Chamberlain (Jon Lindstrom) was in town, and during a portion of his crime spree that led up to a confrontation with his twin Kevin in a funhouse in March 1995, where Ryan was thought to have been killed in an explosion. Even though there is nothing in GH history to indicate Laura or her family ever tangled with Ryan, she would have had to at least been aware of him. Laura also knows that the real Kevin is a compassionate man, and would have wanted to help his brother and heal him. It won’t surprise her to realize that Kevin may have rescued Ryan from the funhouse! She also knows Kevin is an expert cryptographer (code and cipher breaker) and would know Morse Code, although she wouldn’t know that Ryan does too. 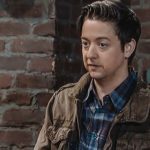 General Hospital Bradford Anderson Back – Spinelli Back In PC To Help Sonny and Jason? Ryan may have learned Morse Code and studied cryptography while in Ferncliff as part of his Kevin impersonation skills. So having just come back from France, Laura may think Kevin has been in Ferncliff all along imprisoned by Ryan, not just recently! Exciting drama and murder mysteries may lie ahead for Port Charles: keep watching General Hospital and checking General Hospital spoilers frequently to see how the current Ryan/Kevin storyline concludes!